Data, Analytics, and Institutional Research is continually expanding the types and quality of data available for our university and external partners. The graphic highlights the general inventory of data we either have currently are have plans to model in the future. Given data and data systems are continually expanding, DAIR is committed to helping our constituents and what they need for their given purposes. While having data is important, UNT also deserves to have data that is trusted, reliable and developed within a larger framework of data governance. 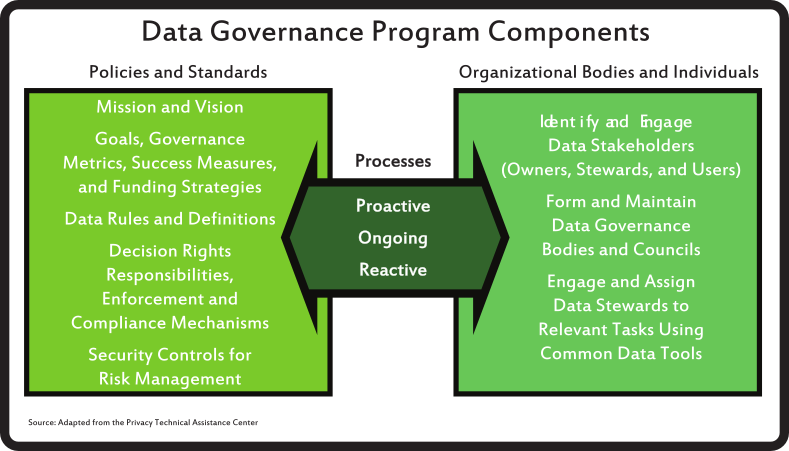 Data governance are a set of principles, processes, and tools described in the graphic below to ensure data validity, veracity, and consistency. DAIR uses a tool known as a RACI matrix to help everyone understand who partners with us in these efforts. 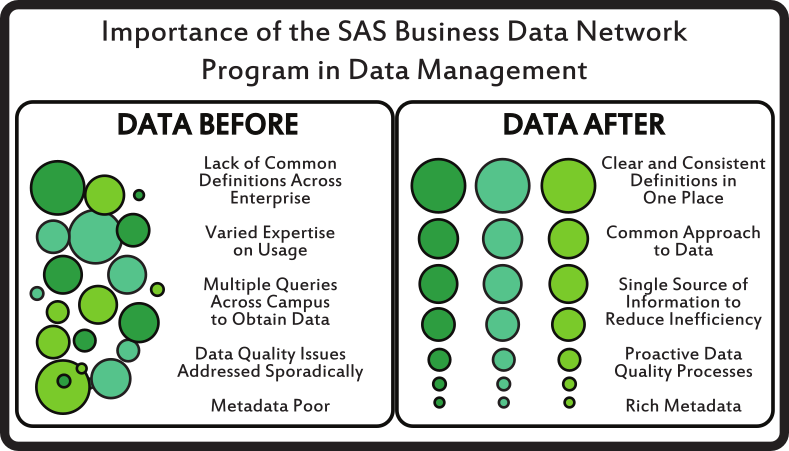 In Fall of 2017, UNT initiated a first of its kind instance of SAS Business Data Network (BDN) for DAIR to partner with Subject Matter Experts (SMEs) and Data Owners on data quality. The graphic highlights the strategic business value this tool provides UNT. DAIR is committed to ensuring that student, faculty, staff, and financial information is secure and safe. In partnership with UNT System Information Security leadership DAIR leverages a multi-faceted approach to maintaining a commitment to information privacy and confidentiality. As shown in the graphic, DAIR leverages training, role-based permissions, and other strategies to protect information. DAIR follows all appropriate State and Federal laws to maintain a commitment to our students, parents, alumni, and employees. DAIR knows how useful our data can be for external reporting and internal analysis. 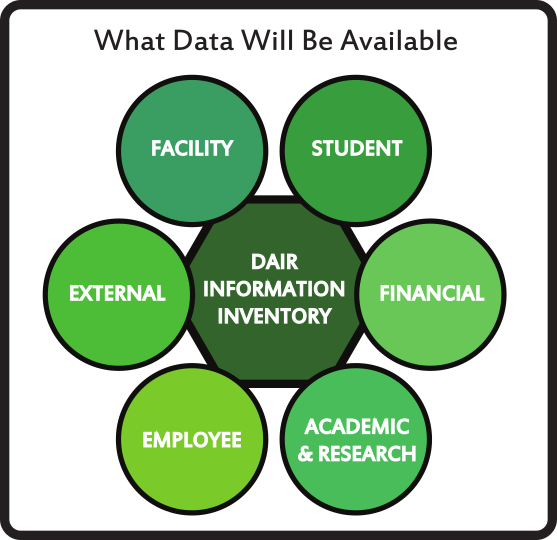 DAIR maintains numerous resources to provide data for a wide array of reporting needs and to respond to externally important surveys. In achieving these goals, IR offers the following data resources in the graphic for users to explore. Please click on a button to be taken to the appropriate data resource. Please note that only current UNT employees with training and permission can access the IR Cognos Reports. Of special note is the the new Texas Higher Education Coordinating Board 60x30xTX data. In conjunction with this new 15 year strategic plan for higher education the old accountability site is no longer being updated. Please contact DAIR staff for assistance with navigating this new system. IPEDS is managed by the National Center for Education Statistics and UNT participates in providing data annually in accordance with Federal mandates. Note that IPEDS data does not follow the same calendar year as State data and differences are to be expected. UNT's Institutional ID is 227216. DAIR is on a journey towards an enterprise-wide data and analytics program charged with identifying creative data solutions to strategic issues in university management. Starting in early 2016, in collaboration with partners from across the UNT enterprise, DAIR conducted stakeholder analysis, engaged SMEs, and held forums with vendors and academic partners. The end result was the launch of the Insights Program - a comprehensive approach to data warehousing and predictive analytics. See how DAIR brings this information to light. Learn more about the Insights Program ecosystem to familiarize yourself with how the program works from a more technical perspective. 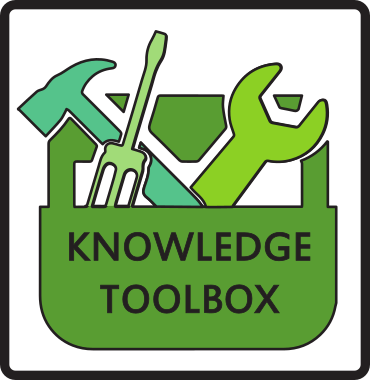 Please visit our training page to learn how to get access to our Insights Analytic products. We want to empower our community of users to get the most out of the data tools and resources we offer. We also know that not everyone learns the same and want to offer a range of approaches to help you get what you need. Beyond giving you new tools, training also helps us ensure that everyone understand the “rules of the road” when it comes to the information resources we are surfacing. For all non-public data resources, training is you first step to receive access and to ensure that we are all doing our part to keep our information resources safe and secure. Interested in Insights Dashboard training? See our flier and sign up using UNT Service Now Request for Access or Training for Insights Program! A member of the DAIR team will contact you about upcoming training opportunities. DAIR offers the following training options to expand your tools to get your job done. Not ready to commit to a full session but want to learn more without getting access to the tools? The following video tutorials are here for you. Finally, the DAIR team would like to give you a glimpse into the readings, background articles, and latest trends in analytics and institutional research. The following Lynda.com videos are helpful as a starting point to understand where DAIR and UNT is going (note: you will need access to Lynda.com to view. UNT employees can login through UNT's LyndaCampus. Zeid, A. (2014). Business transformation: A roadmap for maximizing organizational insights. Hoboken, N.J: John Wiley & Sons. Futhey, T. (2015). IT leadership. In A. Shark (Ed), The digital revolution in higher education: How and why the internet of everything is changing everything (111-134). Alexandria, VA: Public Technology Institution. Gemignani, Z., Gemignani, C., Galentino, R., & Schuermann, P. (2014). Data fluency: Empowering your organization with effective data communication. Indianapolis, IN: John Wiley & Sons. Reinetz, B. T. (2015) Building institutional analytics maturity. October 2015 ECAR Summit Report. Louisville, CO: EDUCAUSE. Swing, R. L. and Ross, L. E. (2016). A new vision for institutional research. Change: The Magazine of Higher Learning, 48(2), 6-13.